This is perhaps my favorite Nicholas Sparks book-to-movie adaptation. The movie was released when I was in middle school. I think we even watched it at church. 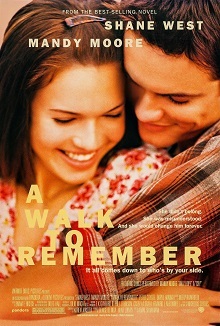 Shane West and Mandy Moore, two of the most recognized actors at the time, were great choices to play Landon and Jamie. While a “star-crossed lovers” story, it’s very endearing, and brings a sense of nostalgia. The book was set in the 1950s. The movie setting was updated to the 1990s, but the small town feel is definitely apparent. I haven’t seen this movie in several years, so I may watch it again very soon! This entry was posted in Challenge, Writing Prompts and tagged Books, Challenges, Love, Memories, Movies, Nostalgia, Romance, Writing, Writing Prompts. Bookmark the permalink. Yes! I’ve heard good things about This Is Us. Several friends of mine watch it. Have a good start to the week, Laura Beth! !